I'm never one to settle on something, so I've decided to change the format of Indies of the Week just a bit. Instead of just doing two to three random products I have, I'm going to review every random item I have from a single brand every week. I realized how long it would take me to get through everything only doing a few at a time, so I changed it up. I'll also be using this post to do any Colors of the Month I purchase in that month as well, so probably the second to last or last Friday of the month will focus on those. This week, I'll be highlighting my small collection of Fyrinnae products! I haven't purchased too much yet from Fyrinnae, but the few things I do have I love. Ok, I lied just a bit. I haven't actually purchased anything from Fyrinnae for myself! 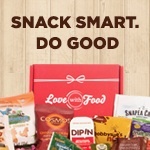 All of the items I have were either gifts or free samples from orders I made as a gift. 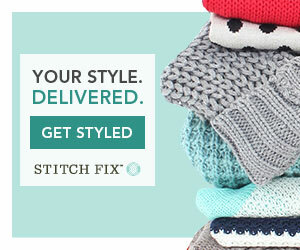 It's a shop I really should purchase from more, as their products are beautiful, I think I just skip over it because they don't have swatches on the site. I usually have to look everything up. 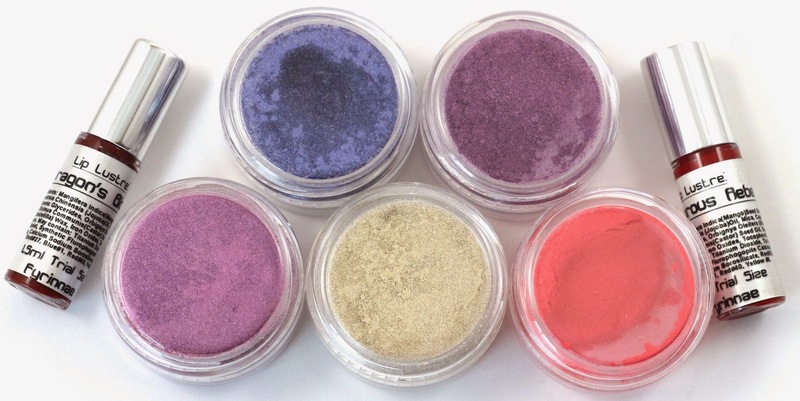 Product Size - Eyeshadows are offered in mini or full size jars. Lip lustres are no longer made in samples, you can only get them as full size tubes. And blushes are also available in mini or full size form. Pixie Epoxy is available in a mini or full size tube. All eyeshadows are swatched over Too Faced Shadow Insurance primer. Blush is swatched over bare skin and blended out. Because Cats - "A wine-grape violet layered on a dark base, sprinkled with a rainbow of sparkle." I just love the sheen this shadow has, and I love the name too! The sheen gives it more of a bluish violet shade than in the jar, and there is tons of sparkle. Meerkat - "Vibrant pink-purple with gold shimmer and sparkle highlight." This one is a perfect example of how Fyrinnae is mostly going to look in the jar. First timers ordering from Fyrinnae sometimes worry about how the shadows look, but the little balls and clumps of shadow are perfectly normal. 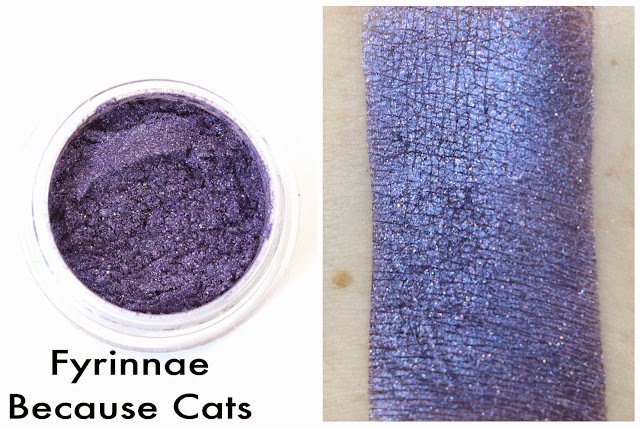 Fyrinnae uses a "wetter" formula, and thus the shadow clumps. It works just the same as other non-clumping eyeshadows, but it helps with adhesion. 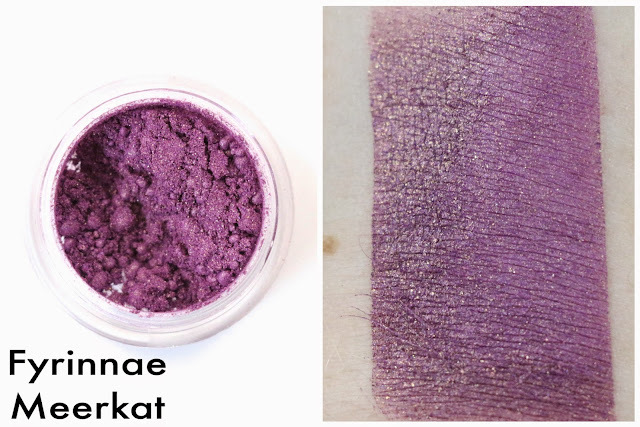 This shadow is a beautiful purple with lots of gold shimmer. Because this shadow is semi-matte, they do not recommend using this over Pixie Epoxy. Nepenthe - "Vivid, metallic Byzantium purple." 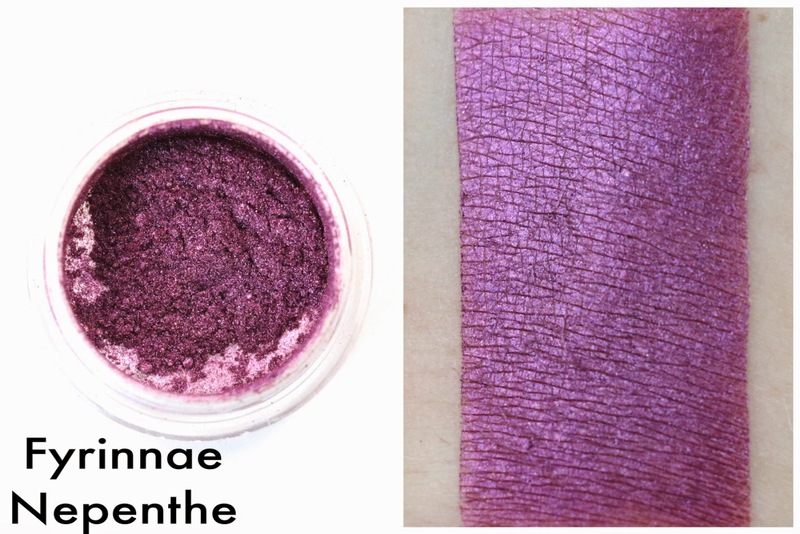 This is such a vivid metallic pink purple shade, and would look phenomenal as an eyeliner. 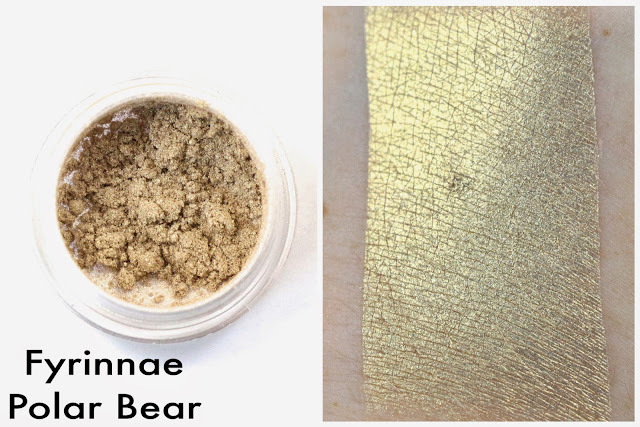 Fyrinnae always includes a free sample product in every order, and it actually comes in a jar instead of a bag. This shadow was a free sample, so you can see the fill level of a free sample. Polar Bear - "Pale gold, shimmery and soft (brilliant gold when the light hits it, but not yellow)." I don't have many pale golds, and this one is just lovely. Would be perfect all over the lid, or in the inner corner, or in the middle for a halo eye, or foiled as a liner. Such a versatile shadow. 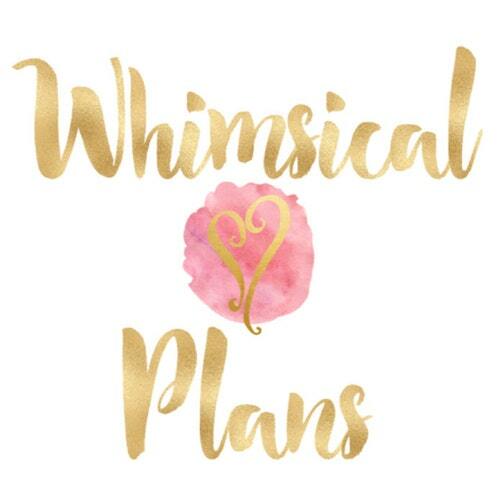 Greek Goddess - "Vibrant pink with a very slight pink shimmer." When I swatch blushes, they usually have a tendency to collect on certain parts of my skin, and show up as darker in some spots or lighter in others. This blush blended like an absolute dream, and even though I probably still had some makeup remover on my skin from the last swatch, it still blended perfectly. And the color is so perfect for many skin tones, just use a little for lighter skin, and a bit more for darker skin tones. I also want to mention this was a free sample in an order, so you can see they were very generous with the product amount. I will probably need all of their blushes now that I know how awesome the formula is. 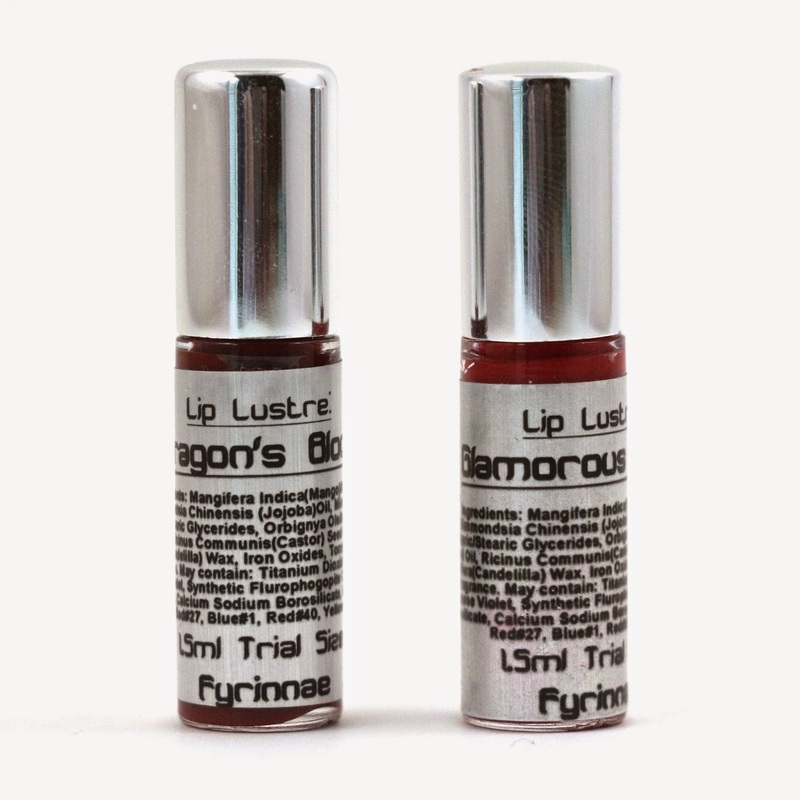 Unfortunately, Lip Lustres are no longer made in sample trial size, only full size now. Which is so sad because I love these two little vials I have. I should have just bought every single color in a sample before they got rid of them, but now it might be a while before I get to try more colors. Dragon's Blood - "A deep, rich maroon-red." The texture of these is kind of like a liquid lipstick, but actually more the consistency of a regular lipstick, but in a tube with a doe foot wand. They look very dry, but don't feel drying on the lips at all. They are actually very moisturizing, and packed with color. They are very opaque, and long lasting as well. This was my first chance trying on this shade, and it's lovely. It's a bit lighter than I anticipated, but would look great any time of year. 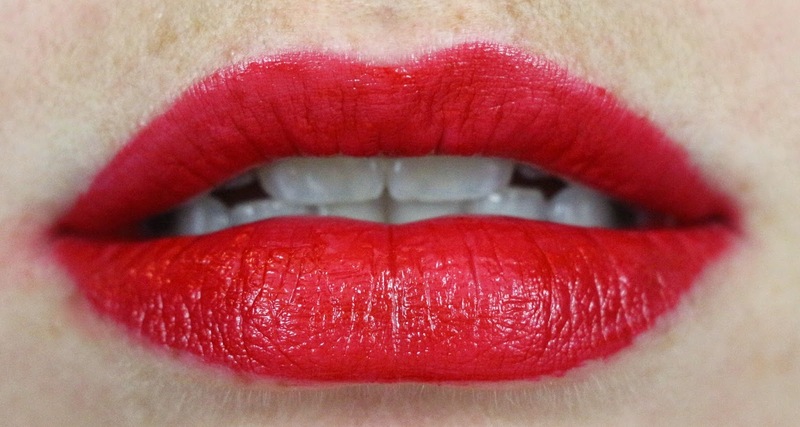 Glamorous Rebel - "Bright, rich cherry red." Excuse my swatch for this, it's an older swatch, but this is just the perfect cherry red. Notice no feathering! They stay in place incredibly well. Now to the pièce de résistance of Fyrinnae, Pixie Epoxy. 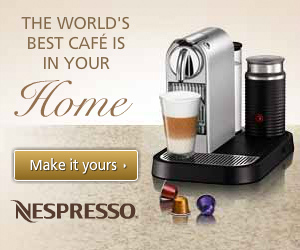 It is a holy grail, one of my must-have products. It's to be used over your eye primer, as a base for your shadows that will make them stick better and make the shadows pop and sparkle. I apply my primer and then sweep my finger over the tip of the doe foot wand and apply the product over one lid. Then wait a second or two and get your shadow on your brush ready. Once the Pixie Epoxy is tacky, pat the shadow over your lid, and you still should be able to blend it a bit. Usually if I try to apply this to both lids and then do my shadow, the second eye has dried already, so I do one eye at a time. It's not going to make applying your shadow fall out free, but definitely reduces it compared to just using shadow over primer. Once everything is dry though, your eyeshadow will be budge proof, and I just love this product. I use it almost every time I do my makeup. Couldn't recommend it enough, you need this in your stash! Availability - All of these shades are available, but the mini Lip Lustres are no longer available. You can still get these shades in a full size though. Recommendation - I really love every product I've tried so far from Fyrinnae, especially Pixie Epoxy. I can't wait to try more blushes, and I really need more eyeshadows and Lip Lustres in my collection. 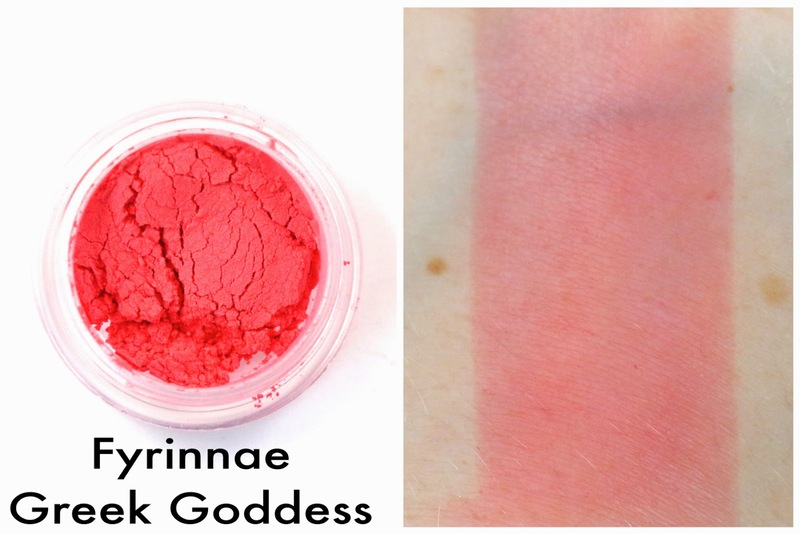 What do you think of Fyrinnae? Let me know in the comments!